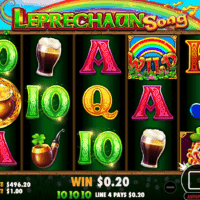 Pragmatic Play has unveiled Leprechaun Song, the latest addition to its premium portfolio of video slots. Set in the green fields of the Leprechaun’s homeland, the 3×5 game captures the merriment that leprechauns are known for, with a jaunty Celtic tune playing as the reels spin. Colourful Irish themed symbols, such as a leprechaun’s hat, pots of gold and pints of stout line the reels. When the Leprechaun sings, treasure chests can be triggered raining wilds and giant symbols. On entering the bonus round, a random feature will be triggered, including giant roaming symbols or free spins, and a progressive free spin cycle can occur, leading to the biggest wins. Pragmatic Play’s game portfolio contains more than 80 proven HTML5 video slots, including Wolf Gold, Madame Destiny and Jade Butterfly. These titles are now live with a growing list of leading casino brands, including The Rank Group, GVC Holdings and Lottoland.